Lightweight standout William “Babyface” Silva masterfully outclassed ultra-tough Arkansas based Guatemalan Rogelio “El Loco” Casarez to become the NBA World and IBO Continental lightweight champion Saturday, March 3 at Banquet Masters in Clearwater, FL. Headlining a six bout card promoted by Fire Fist Boxing Promotions that was broadcast live across the world on Fite.tv, Silva was in control throughout the contest. The Plant City, FL based Brazilian dictated the pace, peppering Casarez with jabs, straight rights, uppercuts and body punches. Casarez, who made multiple attempts to turn the match into a slugfest, repeatedly found himself on the end of Silva’s crisp punches. Casarez bled heavily from a cut that literally soaked the ring canvas but displayed tremendous heart and a remarkable chin. All three judges scored the bout 100-90. With the victory, Silva improves to 25-1 with 14 KO’s. Casarez slides to 13-7 (5 KO’s). Middleweight Antonio “T2” Tarver Jr. impressively overcame a 22 month layoff to down 14 fight veteran Carlos Dixon. Born and raised in Orlando, FL and now fighting out of Tampa, FL, Tarver Jr. quickly took control. After dominating the opening round, Tarver hurt Dixon in the second stanza and teed off until the bout was mercifully stopped. With the victory, Tarver Jr. improves to 5-0 with 4 of those wins coming by knockout. Popular cruiserweight Nick “The Showstopped” Iannuzzi of Tampa scored a highlight-reel third round knockout over Arkansas’ Lemarcus “Frieght Train” Tucker. Fighting for the first time in 3 ½ years, Iannuzzi looked to get reacclimated in the squared circle. Moments before the bell sounded to end round one, Iannuzzi dropped Tucker with a hard straight right hand. In the third, Iannuzzi decked Tucker with another right. The game Tucker made it back to his feet but was in bad shape. Knowing a knockout was imminent, Iannuzzi put Tucker down for good with a massive right hand, sending the crowd into a frenzy. Iannuzzi improves to 19-4 (11 KO’s) as Tucker falls to 5-4-1 (3 KO’s). Featherweight Ricky “Cowboy” Tomlinson of Thonotasassa, FL handed Baltimore, MD native Ernest “Lightning Bug” Hall his first defeat in an entertaining four round contest. With a huge group of supporters cheering him on, Tomlinson worked at a fast pace and was the busier fighter. Both fighters connected with clean shots in this action-packed bout but Tomlinson’s consistency earned him the victory by scores of 40-36 twice and 39-37. Tomlinson ups his record to 6-3-1 with 2 knockouts and Hall slips to 3-1 (1 KO). 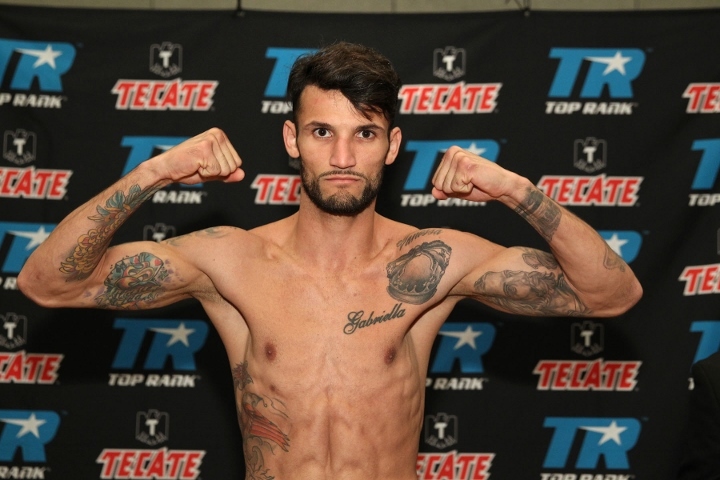 In other bouts, Macon, GA’s Rodriguez Cade, 1-1 (1 KO), knocked out Miami, FL’s Joseph White, 0-2-2, in the closing seconds of a four round bout and junior middleweight Ozodbek Aripov of Fort Myers, FL improved to 2-0 after shutting out ultra-game Savanah, GA native Chaklit Ali Redwood, 0-3 over four rounds. “It was a great evening of boxing and I’d like to thank all the fans who came out or watched on Fite.Tv,” said Jody Caliguire, CEO of Fire Fist Boxing Promotions. “We had knockouts, great action and all around quality boxing. Fire Fist Boxing is just getting started and our plan is to feature top local and international talent. Fire Fist’s next card takes place Saturday, June 16 at the St. Petersburg Coliseum and will be headlined by a showdown between Connor Coyle and Danny Pastrana for the NBA Intercontinental middleweight title. For the latest updates, visit Firefistboxing.net or Facebook.com/firefistboxing.